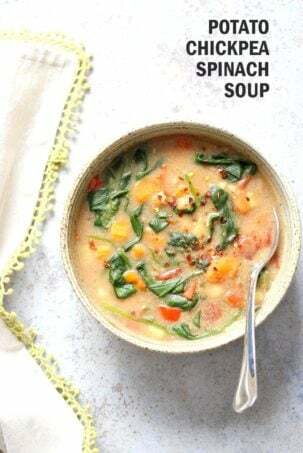 Easy Warming Chickpea Potato Soup that can be made in Instant Pot pressure cooker or Saucepan. 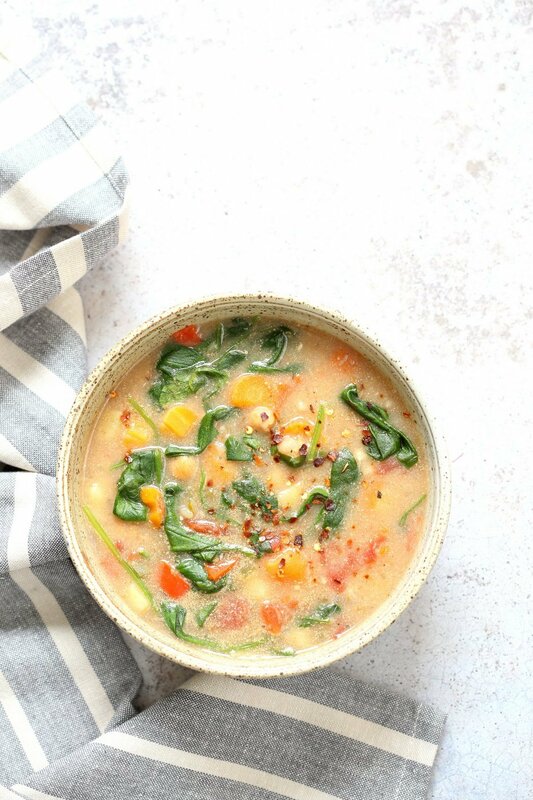 1 Pot Creamy Potato Chickpea Spinach soup with veggies. Vegan Gluten-free Soy-free Nut-free Oil-free Recipe. It’s still pretty cold out here and soup weather. This simple potato chickpea and veggie soup comes together very quickly, has an amazing flavor profile from thyme, oregano, fennel seeds and some pepper and cinnamon, and is hearty and pleasing. Water saute some onion and garlic, mix in the rest of the ingredients and pressure cook or cook in a saucepan. Fold in greens and done. Make it creamy or brothy as you prefer. For creamier, blend up a portion of the soup and mix in. This hearty Soup is easy, flavorful, delicious, and quick. Try it with beans and veggies of choice. See Stove top Saucepan instructions in Recipe note section below. More Instant Pot recipes from the blog! Certain non dairy milks or brands tend to separate when boiled, so use all water or broth and add some cashew cream in the end or blend up a portion of the soup to make a creamy thick soup. Chickpea Potato Soup in Instant Pot. 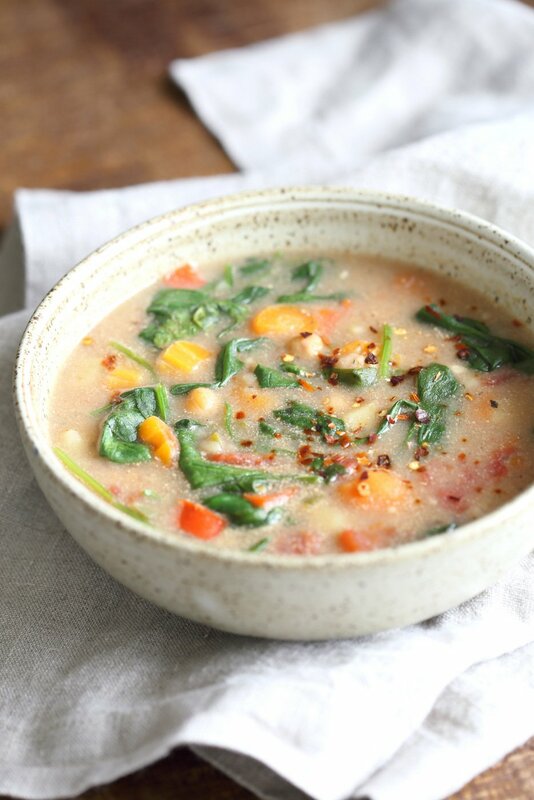 Creamy Potato Chickpea Spinach soup with Veggies. Saucepan option. Vegan Gluten-free Soy-free Nut-free Oil-free Recipe. Add the chopped tomato and mix. Add the spices and herbs and mix in. Add veggies, chickpeas, salt, non dairy milk ** and water and mix. Pressure cook for (manual, hi) 5 minutes, let the pressure release naturally. Fold in spinach and saute for a minute. Add thick cashew cream for creamier soup and mix in. Add black pepper and lemon juice. Taste and adjust salt and flavor. Serve with crackers, garlic rolls or garlic bread. Variations: Use other cooked beans or lentils of choice. If using kale, add it with the potatoes. If using red lentils, use 1/3 cup dried. Saucepan: Follow steps 1 to 3 in a saucepan over medium heat. Add 1.5 cups of water instead of 1 cup. Partially over and cook for 12 to 15 mins or until potatoes are tender. Add in the spinach and continue to simmer for 2 mins. **Note: Certain non dairy milks or brands tend to separate under pressure, so use all water or broth and add some cashew cream in the end or blend up a portion of the soup to make a creamy thick soup. Or mix in 2 tsp flour into the milk and then add to the instant pot. This soup is delicious. I made it with cashew cream as I didn’t have any plant based milks at home and used bok choy for my greens. Thanks again for another wonderful recipe, Richa! That was quick! so glad it turned out great!! I went to your site with the intention of finding a soup for my under the weather husband and it was on the first page and had to try it. My 4 year olds loved it too! Hi Richa! I’m looking forward to making this soup. My husband and I LOVED your instant pot tomato soup!!!! How much spinach do you recommend? Any suggestion on a type of potato? Baking potato, white potato? AWesome! Its 1.5 to 2 cups spinach or any greens. Will it matter if I leave out the fennel (as I don’t like it)? Thanks. Can’t wait to make this. I don’t have an insta pot – do you have an idea how long I should cook it? See the Recipe notes section right below instructions. You will need an addtional 1/2 cup water and simmer over medium for 15 minutes or longer until potatoes are tender. Fold in the greens and taste and adjust. What a beautiful soup! Perfect! You’re awesome! Richa, this is a delicious soup/stew—I had to control myself not to eat the whole batch at once! Made in saucepan on the stove, substituted cannelloni beans for the chickpeas, used unsweetened almond milk. Didn’t have onion or garlic powders but the spicing worked well without–fennel and cinnamon sound strange but work very nicely together. It’s still warm here in NZ but I’ll look forward to this as a go-to for cold autumn days! Awesome! You can add some more chopped garlic with the onion. Instant pot tends to dilute some flavor, so sometimes i add additional powdered versions for concentrated flavor. fennel and cinnamon so work really well together, you can also try some all spice instead. Ok, this was delicious. I had to make some changes but it was still wonderful. I used cumin seed because i was our of fennel seed. I can’t tolerate nightshades so I halved the tomatoes and sub sweet potatoes for the white. I used half soy and half coconut milk because that’s what I had. It separated and looked disgusting after cooking so I added a bit of flour like you suggested on another recipe. I used full fat coconut milk instead of cashew cream because we’re nut free. On top of that I was out of lemons so i used lime juice. Even after all of that it was still delicious. (Though lemon juice would have been better 😋) . Another winner! I doubled the recipe in my IP. Used 2 cups water for initial pressure cooking, then added 2 cups cashew cream in last few minutes. I used mushrooms as my extra veggie. Delicious! Looking forward to leftovers tomorrow evening. Do you have a recipe for the cashew cream? I made this and it was very flavorful and filling for dinner. Unfortunately my soy milk had curdled quite a bit after high pressure cooking. I had already used that batch before so it’s not a faulty batch I think. I might try 3 min high next time and/or repeat with another pack of plant milk. Cheers! Awesome! It doesnt really curdle, it separates. So the taste is fine, just looks weird. Mix a tsp of flour in some more milk and mix in and bring to a boil. When you make it again, add 1-2 tsp flour into the milk and then add into the pot. Made this one recent evening and it was wonderful! My grandsons even ate it with no complaints, which is saying something! Definitely will make this again, but will double the recipe. Thanks! Great tasting soup! Thanks for the recipe. I used immersion blender at the end to thicken a little. Thinking of adding some lentils next time to up the protein a bit. Used sweet potatoes and cooked green lentils (protein) and was very pleased with this fabulous soup. Do I cook it longer if the recipe is doubled? 2 mins more will be sufficient. I know this is a Vegan recipe, but would dairy milk ruin the recipe? I mean no offence. I have no nuts or non dairy milk in the house right now!! And could it be made without potato, or would the flavour profile be vastly changed? you can use more broth or water. I made this today, was so good. I only added some cooked barely at the end with the spinach. So, so good. I used the stove top method and full-fat coconut milk for the non-dairy milk. My dairy-free husband has been searching for a creamy potato soup recipe that tastes delicious, and this hit the mark! So yummy. Thanks for a great recipe! This sounds wonderful! I’m trying it today. Thank you for the plant based milk separation solution.